Chatbots have a long way to go to be self-sufficient, but if you build them on a base of structured content, they can be an extremely helpful content delivery tool. 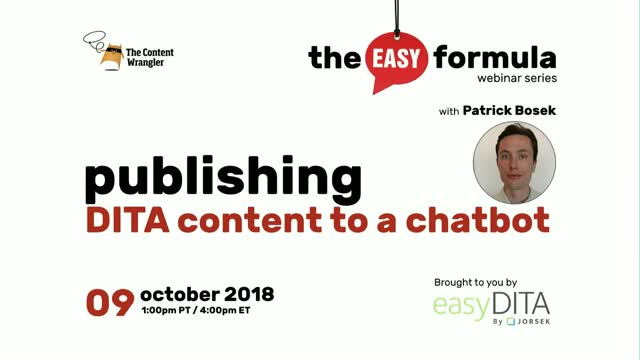 Join Paul Perrotta, sitting in for Scott Abel, The Content Wrangler, and his special guest, Patrick Bosek, co-founder of Jorsek LLC, makers of easyDITA, to learn how to you can create a chatbot using your DITA content. As a part of this presentation, we’ll discuss how chatbots fit into your total content delivery strategy, how to transform DITA content for chatbots, and how to update and maintain chatbots as a delivery system.